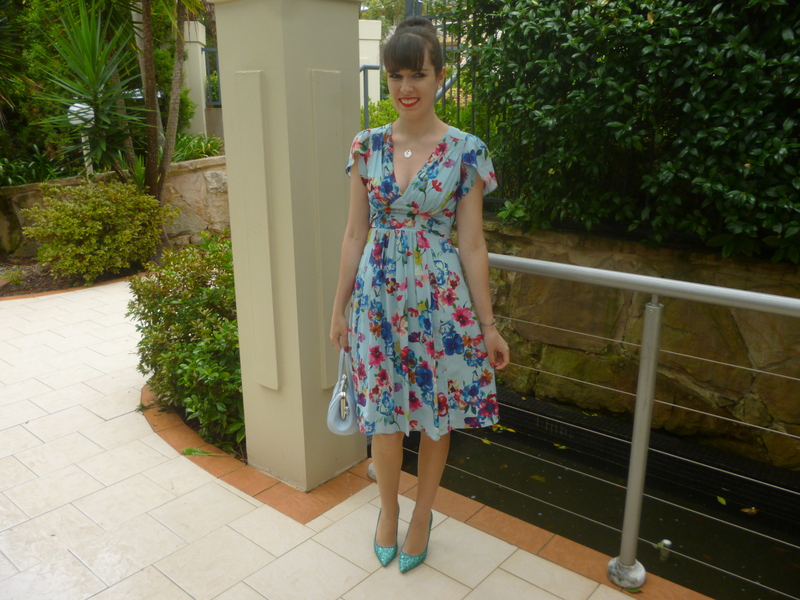 Today’s outfit incorporates a number of new pieces which I received for my birthday. The dress is the newest addition to my wardrobe and I used the excuse of it being my birthday to buy it. I’ve had my eye on this dress from Alannah Hill ever since it came out at least six months ago but the retail price was $400. I would never pay that for a dress. I waited for it to come on sale and it still wasn’t discounted enough. Then it appeared to sell out and eventually disappear from the stores. 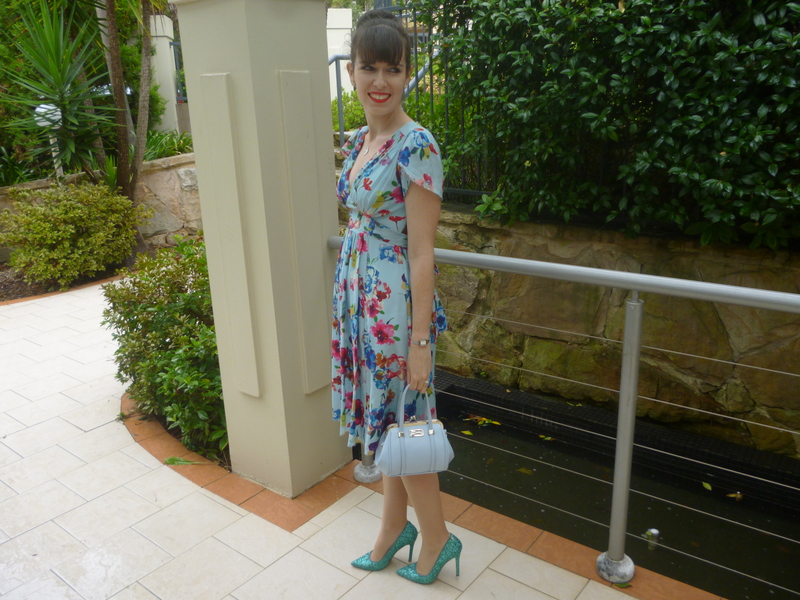 Recently, while in the Alannah Hill store in Chatswood, I noticed there were a couple left, one being in my size, and there was more than 50% off the retail price. Wow! That was pretty exciting. As you can tell, I adore this shade of pale blue at the moment and the whole colour scheme is different from the myriad of floral pieces in my wardrobe. The cut of the dress is also different from what I usually wear. It’s also a lovely soft flowing material too. 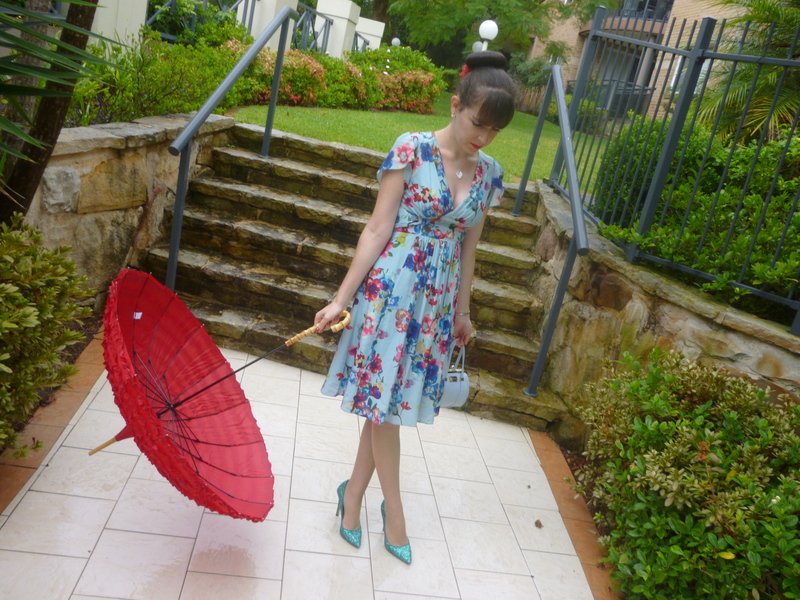 The umbrella is a birthday gift which I received last weekend from my parents. It’s from Kitten D’Amour; I think they wanted to buy me something from my favourite store which wasn’t clothes (which is totally understandable!) 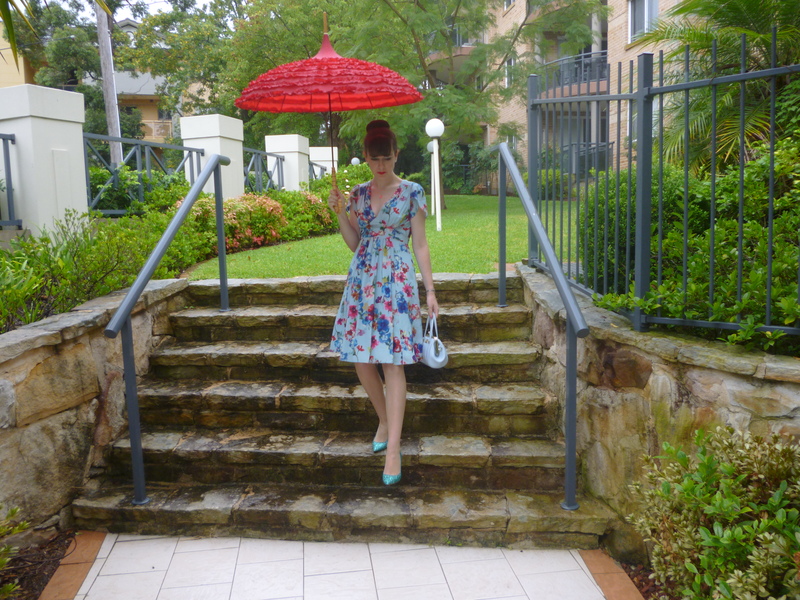 I am amazed by this umbrella; it is so classy and adds a new dimension to the concept of umbrellas. It looks more like a parasol and part of an outfit. 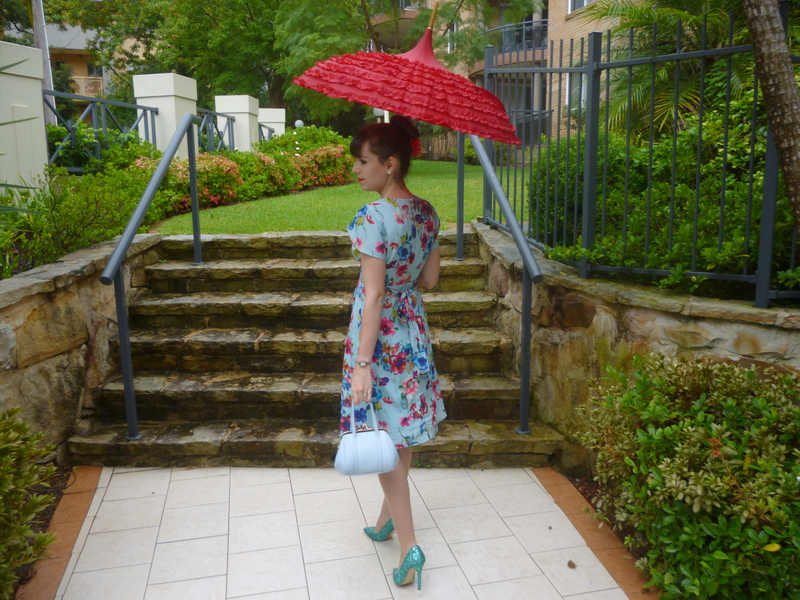 I actually thought all the umbrellas in Kitten D’Amour were paper parasols; I was surprised to see that a number of them are proper functioning umbrellas. I actually want it to rain at the moment so I can use it. My spending is really out of control at the moment, it seems like every time I make plans to save money the spending becomes worse, and I am so sick of it. I spend to fill a significant void in my life, to deal with the problems of life and to feel relief from how depressed I feel every single day. There’s nothing else which makes me feel better and my problems never seem to go away, year after year. But it has come to the point where even the spending will not make me feel better. In the last year, where I have spent the most, I’ve actually been the most miserable. A new dress no longer seems to make up for everything else I’m missing in my life. The spending is going to stop. 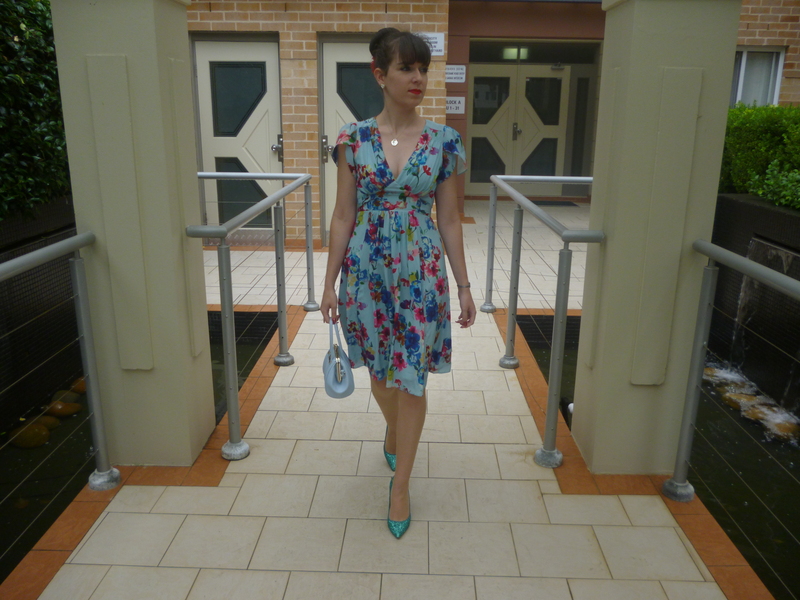 This entry was posted in Alannah Hill, Forever New, Kitten D'Amour, Mimco. Bookmark the permalink. This look is so “you” 🙂 So cute! The umbrella is so pretty! Lovely photos! And don't forbid yourself from shopping – it's like dieting, the more restrictions you create, the more you want it.